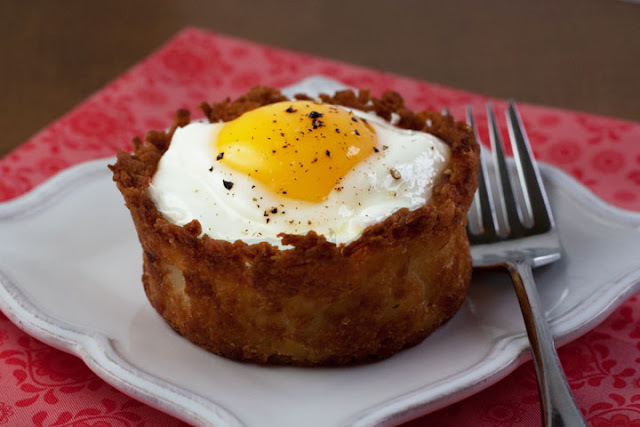 This simple brunch dish is perfect whether you’re serving one person or a crowd. The sauce and crusts can even be made up to a day ahead. Simply assemble and bake just before serving. Spray (4) 8-ounce/225g ramekins with cooking spray. To make the crusts, place the shredded potatoes in a clean dishtowel and squeeze out as much moisture as possible (this can be done in a few batches, if necessary). Toss with the melted butter. Divide the potato mixture evenly among the four prepared ramekins and press the mixture into the bottom and up the sides to form a crust with an even thickness. Bake in the preheated oven for 30 to 35 minutes, until beginning to brown and crisp. Remove from the oven and reduce the heat to 400F/200C/Gas6. To make the filling, heat a large skillet over medium-high heat. Add the butter. When the butter is melted, add the onions and cook, stirring occasionally, until the onions are soft and just beginning to brown, about 6 minutes. Reduce the heat to medium-low and add ¼ cup of the cream. Continue to cook, stirring, for about 3 minutes more, until the cream begins to thicken. Remove from the heat and stir in the parmesan, salt, and pepper. Taste and adjust seasonings as needed. Spoon the sauce into the prepared crusts, dividing equally. Break one egg into each ramekin, on top of the onion-cream mixture. Season each with more salt and pepper, as desired, then drizzle with the remaining tablespoon of cream, dividing equally. Bake in the preheated oven for about 20 minutes, or until the white has set but the yoke is still runny. Carefully remove the crusts from the ramekins and serve immediately.